Hello from Kansas City! We are making our final preparations here and are excited to welcome around 6,000 clay lovers to Kansas City!!!! It looks like we are going to be blessed with pretty good spring weather for the conference, so pack accordingly! If you haven’t downloaded the NCECA App yet, what are you waiting for? • I strongly recommend that you vote in the NCECA Board Member Election before you leave on the plane. Although voting continues through 4pm on Friday of the conference, things get hectic and time has a way of slipping away. If you haven’t seen your ballot in your email, watch for a reminder on Sunday afternoon. Still don’t find it or having problems voting? Click here for help. If you want to meet the candidates face to face before you vote, be sure to attend the members meeting on Thursday at 8:15am. A final reminder to vote will go out shortly after that meeting. • Keep your eyes peeled as you head toward KC! You are definitely likely to see some other ceramics folks heading the same way. I like to play a fun game I call “guess the potters” (term potters used loosely to describe anyone who works in clay, btw). It’s especially fun at the destination airport. Anyone in a suit is automatically disqualified. Everyone else gets a “potterscore” Points are given for beards or blue jeans, bonus points for iron oxide stains on the jeans, points for flannel, comfortable shoes, you get the idea. You can make your own rules. But I digress….. Upon your arrival at the Kansas City Airport, you will need to get transportation to your hotel. Discounted airport transportation is provided through SuperShuttle. Book online at by clicking here or by calling 1-800-BLUEVAN (258-3826) and provide the discount code: 3CZT9. Van shuttle service is $15.00 one way; $30.00 round trip includes group discount. Taxis from Kansas City International Airport to the downtown hotels cost approximately $47-$50 one way. • The Marriott Hotel main tower has a fabulous lobby area and bar. It’s a good place to meet up. You should know there are two separate buildings for the Marriott, and they are connected via airwalk. 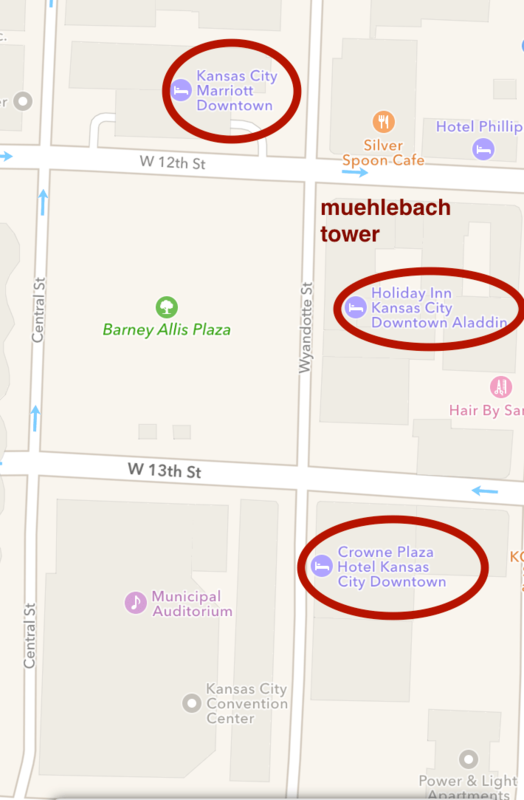 The other tower is called the Muehlebach, and that’s where the dance will be Friday night. In case you haven’t explored the App Map, here’s a quick look at the relationships of the hotels. • Once you are all checked in to your hotel, you might want to head to the convention center to look around and get checked in for the conference. Checkin for preregistered attendees, onsite registration & Bus Tour onsite signup is all on the second floor lobby of the Convention Center. There are a variety of ways into the convention center, but with the weather as nice as it is, it will probably be best to walk outside and look for the big NCECA banner on the skywalk over central street. Go there, go in the first door you find, and head upstairs. And again, check the map in the app! 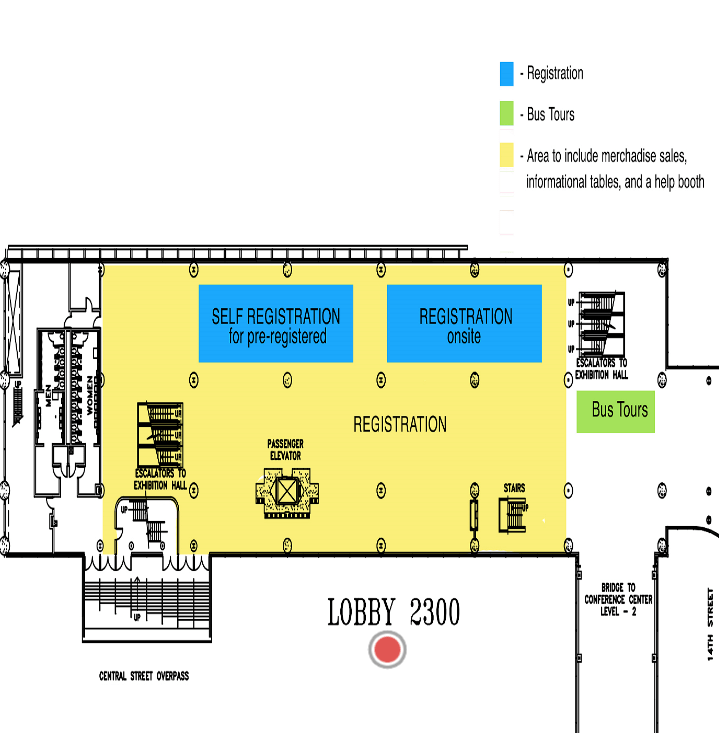 Please note: The Resource Hall will be locked on Tuesday while exhibitors are setting up. You can not get in to poke around in there or even say hi to a person you know is in there. Even if it’s your Mom. • You may have heard that NCECA has adopted a new system that will improve and streamline the checkin process. You should have received an email with a QR code that you can scan on the express pass kiosk to confirm your conference information and print your name tag. • YES we will have lots of people standing by to help if you have any problems at all. NCECA has worked hard to build relationships with our conference presenters and plan this conference. Presenters have granted permission for NCECA to document presentations for educational purposes. The permission to document conference proceedings using personal devices is not extended to individuals attending the conference via their registration. Please respect the personal rights of our presenters as well as NCECA’s rights by not recording our sessions. • Lastly…for those of you using the app, be sure to check out the CLICK game on page two. You could win a conference pass for the 2017 Conference, plus the game is a lot of fun and will help you see and find things you may have otherwise missed.